Last Saturday, NHL and I played a game of Nuclear War with each other. He launched missiles at me, I retaliated, millions were killed. A fun time was had by all. 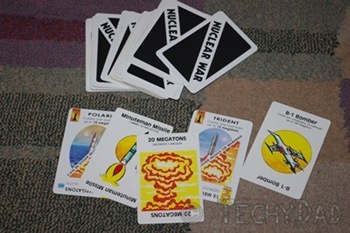 Of course, I’m not referring to actual war, but to the card game by Flying Buffalo named Nuclear War. I was introduced to Nuclear War by a co-worker years ago. We played a few games together and she even gave me a few cards (since she had so many). I purchased some more and played a bit. However, I didn’t have too many people that shared my interest and so the game wound up packed away. Recently, I realized that NHL might be old enough to play the game with me. Moreover, he’s shown himself to be just the kind of geek-in-training to enjoy this kind of card game. So, after some obsessive searching to find just where I put the cards so long ago, I found some time to play with NHL. The basic concept of the game is that each player represents a country. Each player gets a series of cards representing their population and another series of cards representing their weaponry (along with propaganda and other cards with special abilities). As players put their cards down and play them, they might convince members of the opposing country to defect to their country. They might wreck havoc with the opposing country’s defense/offense. Or, they might just drop a big missile on the other country and wipe out some of the population. Each time a missile is dropped, dice are rolled to determine just how much carnage resulted. Was the missile a dud? Did it kill the number of people that the card says it killed? (Missiles and warheads come with differing megaton ratings which means differing numbers of people killed.) Or did the attacking player get lucky and double the damage? Once the dice are rolled, a special six-sided die can be rolled. This can either nullify the damage, worsen it, or even make the damage happen to the attacking country instead. It’s a risk that makes the game more entertaining. Do you stay with 3 million killed or roll the die and try for more? To be perfectly fair, we didn’t play the game "properly." I couldn’t remember all of the rules, the printed materials I had online didn’t have key points, and I was offline for Shabbat so I couldn’t just look them up online. So we made the best of it and altered our play as I remembered items or made mental notes to play any second game with the remembered rules. (I’ve since found the rules online and plan on printing them out to keep with the game.) We also played with cards face up instead of face down so I could help NHL in his first game. I made sure to play as if I couldn’t see his cards, though. In the end, NHL beat me. He obtained a bomber which dropped bomb after bomb on me. Meanwhile, my bombs kept going dud or, worse, wound up hitting my own population. After he launched a stealth bomber with a 100 megaton warhead at me, it was all but over. One final missile finished me off. This is usually where Nuclear War players can have "final retaliation." They can put all of the missiles in their hand into play in one last chance for revenge. 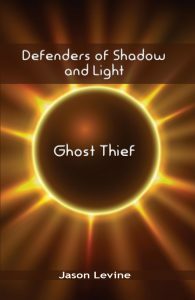 It can kill off players who then launch their own final retaliations leading to no winners. In my case, though, I only had 2 missiles at my disposal and they were weak ones. Not nearly enough to eliminate NHL’s people. This might seem like a violent game, but the carnage is very abstracted. You "make change" of population cards the way one might make change of Monopoly money. The game also teaches valuable skills such as planning (do I use my propaganda cards before anyone launches a missile – since they’re useless after – or do I launch missiles first to stop others from using propaganda on me?) and risk taking (do I roll the "extra damage die" to get more casualties even though I’m risking the ones I already have?). It can even teach how nuclear conflict might not quite be the best way to resolve real life conflicts (see Final Retaliation). It’s definitely a fun game and I can’t wait to play more games with him. Maybe I’ll even beat him this time. What card/board games do you play with your kids?